We are always happy to answer your questions and discuss bulldogs! Please look over the PCBC Membership Application and Code of Ethics Here. If you would like to join the Bulldog Club of America please look over the BCA Membership Application Here. 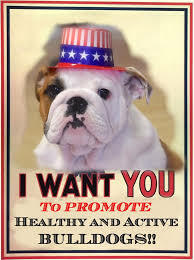 If you are interested in Bulldogs and would like to talk to a member about joining our club please see the Contact page for members that can help you. If you would like to meet other members you are welcome to come to our meetings. For Location and Time of our meetings please see our Members page.